The September 2014 Scottish independence referendum was an event of profound constitutional and political significance, not only for Scotland, but for the UK as a whole. Although Scottish voters chose to remain in the UK, the experience of the referendum and the subsequent political reaction to the 'No' vote that triggered significant reforms to the devolution settlement have fundamentally altered Scotland's position within the Union. The extraordinary success of theScottish National Party at the 2015 General Election also indicates that the territorial dimension to UK constitutional politics is more prominent than ever, destabilising key assumptions about the location and exercise of constitutional authority within the UK. The political and constitutionalimplications of the referendum are still unfolding, and it is by no means certain that the Union will survive.Providing a systematic and academic analysis of the referendum and its aftermath, this interdisciplinary edited collection brings together public lawyers, political scientists, economists, and historians in an effort to look both backwards to, and forwards from, the referendum. The chapters evaluate the historical events leading up to the referendum, the referendum process, and the key issues arising from the referendum debate. 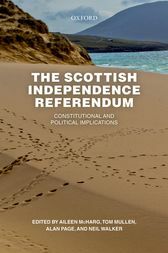 They also explore the implications of the referendum both for thefuture governance of Scotland and for the UK's territorial constitution, drawing on comparative experience in order to understand how the constitution may evolve, and how the independence debate may play out in future. although the book was published at a time of unprecedented political and constitutional instability, it will remain a commendable study of the (first?) Scottish independence referendum which, owing to the quality of the authors involved and their mastery of their respective fields, offers more than a snapshot in time and provides many excellent insights into Scottish politics and on the dynamics of constitutional change in the UK. Aileen McHarg is Professor of Public Law at the University of Strathclyde. She has written extensively on Scots and UK public law, and participated actively in the referendum debate. Together with the other editors of this volume, she was a founding member of the Scottish Constitutional Futures Forum. She is also a member of the Law Society of Scotland's Constitutional Law Sub-Committee, an executive member of the UK Constitutional Law Association, and AnalysisEditor of the Edinburgh Law Review.Tom Mullen is Professor of Law at the University of Glasgow. His research interests include constitutional law, administrative law and housing law, and he has written widely on these subjects. In the last few years, he has been working extensively on constitutional change in the UK.Alan Page is Professor of Public Law at the University of Dundee. He has written extensively on the constitutional law and governance of Scotland since devolution and the independence referendum.Neil Walker is Regius Professor of Public Law and the Law of Nature and Nations at the University of Edinburgh, having previously been Professor of European Law at the European University Institute. He has written extensively on matters of UK, European, and transnational constitutional theory and practice. He is a Fellow of the British Academy and also of the Royal Society of Edinburgh. He is general editor of the OUP monograph series Oxford ConstitutionalTheory.